Chief Appraiser Carolyn Allen faces the heat at the Polk County Chamber of Commerce on February 11, 2010. Polk County Chief Appraiser Holds Public Forum, LIVINGSTON, February 11, 2010 - Polk Central Appraisal District Chief Appraiser Carolyn Allen held a public forum at 1 pm on February 11, 2010 at the Livingston/Polk County Chamber of Commerce to clear up misconceptions and to speak openly and honestly about property appraisal and values. Allen took questions from the audience, some of the questions were pointed and with disgruntled tone. Allen pointed out that the Polk Central Appraisal District has nothing to do with taxes but only the value of property. 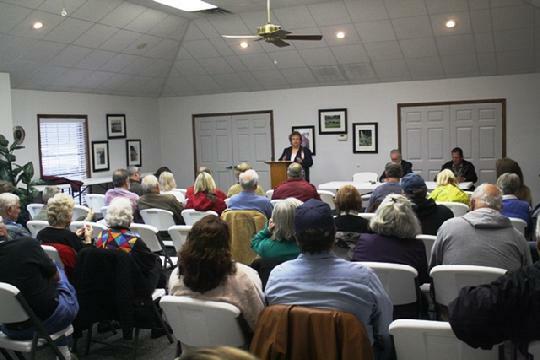 She also urged property owners that feel their property is unfairly valued to come into the Appraisal District (located on Matthews Street in Livingston) and talk to your appraiser. "Take pictures, make a list, come talk to us" Allen said. After seeing your appraiser, if you feel there is still a problem with your property values, the Appraisal District has an Appraisal Review Board made up of citizens who are neutral and not paid to review cases. The appraisal district's board of directors appoints ARB members. Members must be residents of the appraisal district for at least two years to serve. Current officers and employees of the appraisal district, taxing units and the Texas Comptroller's office may not serve. ARB members also must comply with special state laws on conflict of interest. Allen also pointed out that the appraisal district has a legislative mandate to be at 100% market value. According to Allen, the property value study done by the comptroller's Property Tax Assistance Division (PTAD) shows Polk County is not at 100% market value. "I do not relish raising values, but I must follow the laws of the state of Texas, the Property Tax Code, and the rules of the Comptroller", Allen said. "Help me to help you by taking the time to look at your property, you know your property and can find defects inside that we cannot see. Bring these photos to the appraisal district's attention. That is all the appraisal district can do; work with you individually on your individual problems". 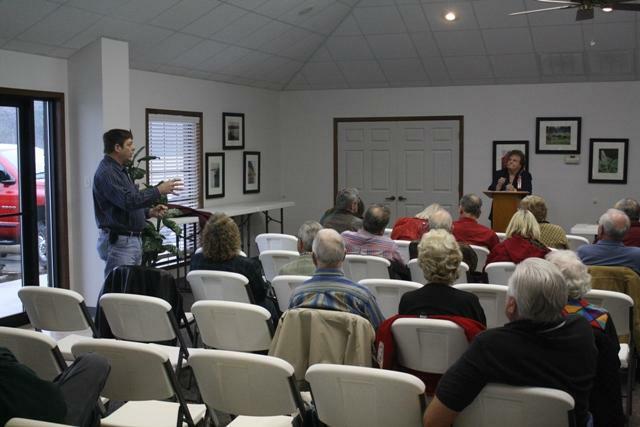 Polk County Chief Appraiser Carolyn Allen took several pointed questions from Onalaska resident Rick Andrews.